There is a fairly new buzz word in the frugal cooking world – once a month cooking. Once a month cooking is the newest and latest thing to do to save money and to get organized. Once again, I have to chuckle at this generation. (I think that means I’m getting old – oh no!) They think they have invented something new, amazing and wonderful. I hate to break it to everyone but cooking large amounts of food and storing it away for later use has really been going on for a long long time. I remember my grandmother talking about preparing food 2-3 weeks before threshing crews came and needed to be fed. Once a month cooking was also one of the ways I supported us 30 years ago. Once a month, people would bring me their groceries and their recipes and they would pay me to cook 15 freezer meals. I would call it marathon cooking because by the end of each cooking session I felt like I had run a marathon. Once a month cooking has been around for a while and, like everything else, it also has its pros and cons. In this article, I will be playing the devil’s advocate. I want to present a side you don’t often see addressed so you can decide whether or not it is for you and to let you know there is nothing wrong with you if you decide not to do it. You are not sub-human if you can’t spend 2-3 very long days cooking till you drop just so you can say you have 15 meals in your freezer to pop out at a moment’s notice. I hate seeing so many women having to deal with false guilt all the time. Often it’s because they are not given all of the information about something so they think they are total failures. Let me give you an example. You have the TV on while you are trying to rock your colicky baby. Your toddler has just destroyed the whole room in the 5 minutes since you sat down and is now swinging from the chandelier. You got 2 hours of sleep last night and this morning you barely had time to scrape your hair into a ponytail, let alone comb it. She had a hairdresser and make up artist work on her for 1 hour before she came on the show. She looks so bright eyed and refreshed because she spent the night in a luxury hotel with grandma at home babysitting the kids. She said she spends one long day cooking 15-17 meals for the month but only as an afterthought at the end does she mention that she had two or three other people helping, totaling 21-24 man hours. This means if she was doing all of the once a month cooking alone, it would take 8 hours of non stop cooking for 3 solid days and doing nothing else for those 3 days. Another thing she only mentioned in passing at the end was that she has someone babysitting her kids this whole time. When done alone, it would mean asking someone to babysit your kids for three 8 hour days. She said that it saves time. If you do once a month cooking, it only takes about 30 minutes to an hour to make a meal. I rarely spend over 30 minutes cooking a meal for 4 on a daily basis anyway, so how does that save time? She also said that once a month cooking saves on clean up. How? 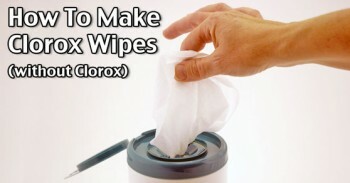 You still have dishes to wash, tables and counters to wipe down at any meal. Maybe you are saving yourself from washing two or three pans but if you think about the amount of time it takes to wrap and rewrap that same meal to freeze, it takes just about as much time as it takes to wash one or two pans. This is only true when you’re using disposable pans or something like that. If you freeze it in a regular pan, you still have that pan to wash.
Then there is the time you spend shuffling through the freezer trying to find things or carefully writing down exactly what you have and marking the packages so you know what you have in them and how long it’s been there. All of this takes time and can take up as much time as just wiping out a pan to clean it. Foil, plastic wrap, freezer paper and disposable pans. Electricity to run a large enough freezer to store the frozen dinners. If there is a power outage or if the freezer door gets left open and everything is ruined. Not only do you lose money, but also the time it took to fix it all. If you add in all these costs, you end up spending more. Are they really delicious homemade meals? I’m not sure if it is just me or not but when casseroles and those types of dishes are put in the freezer, they taste like they have been in the freezer. They can be wrapped in 25 layers and still taste like the freezer unless they’re vacuum sealed. Things tend to separate and become watery. Lots of ingredients don’t freeze well. I’m sorry but there is a point when there are so many things to think about that I am not sure it is really worth preparing food that way or if it really simplifies my life. That doesn’t mean you shouldn’t ever freeze anything. (As a matter of fact I will give you some tips on freezing at the end of this post) Think through all of these things before you just jump on the bandwagon to try them and don’t browbeat yourself if you try to do them and fail. Often, the people who write or talk about these things have circumstances that make things easier for them, like extended families who are willing to come in and help cook and babysit. Sometimes they have large families with older kids who can help cook or babysit. If you are on your own with little ones to take care of, you might think of other ways to save time or make things easier. 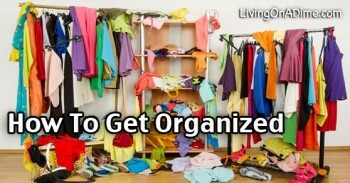 For myself and a majority of the people I talk to, I have found that whether it comes to spring cleaning, organizing your house or making your meals, breaking things down into small steps usually works better than to do anything “marathon style”. On that note, here are a few cooking and freezing tips to help you get started if you decide it’s for you. These steps are more of a happy medium when it comes to meal planning. Any or all of these tips can be used by the “average” person. Most meats freeze well. When cooking something like hamburger, make some extra to keep in the freezer. Use the same philosophy with roasts. Cook an extra one when while you have your oven going. Then you’ll have one step and one pan less to deal with on another day when things are more hectic. Figuring out and preparing the meat or main dish for a meal is half the battle for most of us. Depending on the size of your family and the roast, you can normally get at least two meals from one roast, which means you can very easily have four meals taken care of just by adding an extra roast while the oven is on. Make 5 pounds of hamburger into meatballs, meatloaves and other east to use forms to freeze while you are already making something with hamburger and have it ready. This will only take one hour and you can get five to seven meals worth of meat cooked. Most casseroles make a large batch or you can easily double them so make an extra one once in a while to have for something quick. Even though all of the above negatives still apply, it is different feeding your family a not so perfect casserole once in a while in a pinch than to do it every other night like you would with once a month cooking. Certain foods freeze and taste better than others. Find out what your favorites are and use them when you can. Most vegetables freeze great so, instead of spending ages chopping up fresh vegetables for a casserole, grab some frozen ones to save time. The same rule applies with potatoes like hash browns and tater tots. These are all shortcuts that can help you save time without having to resort to marathon cooking. I have written pages and pages of other ideas on this same subject so it would be foolish for me to rewrite everything here so if you’d like more help, you might consider getting some of our e books, which are filled with lots of great tips and suggestions. We do touch on freezing things in our Dining on a Dime Cookbook, too. My Recipe For Homemade Rye Crisps Storing and Cooking Potatoes Transporting Food In The Car Does It Make A Difference Boiling Water on the Stove or Microwave? I think frozen casseroles taste yucky too. Not as good as freshly made. 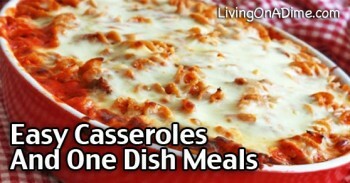 Also, Jill, You mentioned not to long ago that some people call casseroles “one dish meals” these days. I just think it’s a matter of what part of the Country you are from, because where I live they are still called casseroles. In other parts of the Country they are called, “hot dishes” so I guess everyone has a different name for the same thing. AND it has nothing to do with your age. I have been hearing a lot lately about the once a month cooking craze. Thanks for the article and all of the great thoughts to consider about it. I have a question about a casserole you mentioned in another post on the blog. It was a casserole using chicken, cream of chicken soup and stuffing. I want to try this recipe. I don’t have much time to prepare meals before my husband has to leave for work in the evenings. I try to prepare a lot the night before so I can just put things in the oven when I get home from work. Therefore, could I assemble that casserole the night before, put it in the fridge and then take out and bake that evening? Do you think that would work? I’m still making the oven slow cooked roast that I read about on this blog. That one is great for me. I’ve seasoned the roast many different ways and it always comes out great. I still can’t believe I can serve my family a roast that wonderful on a weeknight! So much better than the crockpot. Easy, easy, easy! Thank you so much! Angie I think it is the chicken supreme recipe you are talking about. I don’t see why you couldn’t do it ahead of time. It calls for a topping to be sprinkled on top of it and I would just wait and sprinkle the topping on right before you bake it. That goes with most anything you top a casserole with. The topping might get a little soggier then you maybe want it to be. I don’t know if it is the exact same recipe, but I make a casserole that sounds similar to Chicken Supreme. I often assemble it the evening before or at lunch time, so I can pop it in the oven after work. Like Jill said, just leave off the stuffing till right before you place in the oven. I don’t notice any difference in the taste. I have also frozen it (again without the stuffing on top), but it didn’t turn out quite as good, because it was more watery than normal, but it was ok for a quick meal. I wouldn’t freeze it all the time though. get your entire family involved. 4 year old breaks up lettuce for salads. 6 year old can chop carrots celery and put them into snack bags for lunches. or for soups stews and relish plates and salads. 10 year old measure out the dry ingredients for biscuits, pancakes, cakes what ever is needed. scrub the carrots potatoes and have them ready to be cut up for the meal. get the meat sorted into appropriate sizes and put it away in the freezer or fridge in a bag with the spices already added. That way you come in the door tired and not too interested in cooking but all you have to do is hand the 6 year old the bags with salad fixing he gets the bowl and mixes it. Put dressing on the table. The 10 year old can cut the potatoes up small and put them in the pan with water add a bit of salt and turn the stove on. The 4 year old can set the table. Maybe not with the best china but if it is set on the table he can place the dishes. You take the meat out of the fridge and put it in the pan. Your family has a hot fresh meal in under an hour on a slow day and usually 30 min. after you walk in the door. This is how I used to do supper most of the time when my family was growing up. Prep for the week took about an hour and it was quality time with my children. When I had younger children and worked, I found that making the next evening’s dinner while we in the kitchen having dinner, made the next day’s prep so much faster. So for example, if I made meatloaf for Monday evening, I would make a 1 lb meatloaf, and use another 1/2 lb for Tuesday’s spaghetti sauce, which simmered while we ate. Tuesday night’s salad was made double sized and dressing served on the side, so there was a premade salad for Wednesday, and so on. It was so much easier than trying to make all that food in one session. If I made a roast, I immediately sliced the rest and froze so we weren’t eating “leftovers”. it was used a week or so later for a new meal. This was just s system that worked for me. I would also prep a casserole early in the morning, and have one of my kids pop it in the oven around 5:00, That way dinner was pretty much ready to go at 6:00 each night. We found the consistency of a standard dinner time made life a little more stable. I do some once a month cooking. I do most of my shopping once a month so it’s easy for me. I make a peppers and onions mix for stirfry or mexican dishes. I also put a lot of meat in the freezer as well. ( Portion out ground meat into meal sized portions) Or I pre-make pizza crusts and other things. I cook from scratch (no cream of___ soup or any mixes) so these short cuts make dinner easy for me. I mostly cook once a week. Most of my cooking is done on Sundays. If I am in a mood to cook on the weekdays, I will do make something too. But I try to make a little more to keep in the fridge for another use too.Since I take oncall jobs, it helps me not to have any take outs. I tried a variation of make-ahead meals; since there’s just 2 of us in my household, I would just double the recipe, cook it all at once & freeze half. Then I would have the 1/2 left for another day. However, every time I did this, and reheated the frozen 1/2, it NEVER tasted as good. I just stopped doing it because it wasn’t worth it to me. Something I like that eliminates prep work before dinner is using the crockpot. Originally when I started using it, I thought, fantastic this is awesome; however, I quickly realized that instead of doing prep work before dinner, I was just doing it after dinner (I would prepare the next day’s crockpot meal after dinner was done that day). So, the prep work time was the same; it really just saved me time that would have been spent at the stove actively cooking. You are welcome Claire. Sometimes I think “am I the only one who sees this this way” so it is nice to know I am not weird in my thinking on something. I batch cook for the freezer all the time – it takes no more time to make a big batch of, say, bolognese sauce or a casserole, than a small one, and I keep an eye out for bargain cuts of meat too. My freezer is always stacked full of tubs of frozen meals. I like the OAMC idea. I love it! It’s a great IDEA. Like you said though it is NOT for everyone. I have a 13 y/o and a 23 month old son. I work a 40 hr a week job from home, run around after my little guy, homeschool my teen, run him back and forth to bowling leagues and tournaments, oh and a husband and still wants to see me at some point at the end of the day. My closest family member outside our home is roughly 9 hours away. Needless to say OAMC doesn’t work for me BUT, those recipes are great to help with meal planning. I plan my meals once a week and spend a few hours on the weekend spiking up what I can. I get 30 foil pans for under $7 @our warehouse store. Cooking things our prepping things just a week at a time saves me the stress of hearing “what’s for dinner?” & replying I don’t know. We have picky eaters to so I have to change things in my recipes all the time. People should NEVER be afraid to do this. We have always been a fast food family on the go and this is my resolution this year. Since the start of the year we have eaten fast food, I think, 4 times. They were times when we were traveling long distances. I’m the mom with things turned upside down in her home with the kid hanging from the ceiling. If you plan your meals a week at a time, just 1 week at a time it saves you time just in knowing what you’re having. I have felt like a failure till I started this. If you simply know, it simplifies. Myssi, this is so true and it sounds like you are off to a really good start. For some of you even a week’s worth of planning is overwhelming so if you have to for a couple of weeks try just planning what you are going to have the day before. Even that will help many of you. After you get into the habit of that then work you way up to a week. Also if you are going on vacation with your family and want to save a little money on food, bring your crock pot. When we went out of town last month I cooked up a few pounds of ground beef and partially cooked some spaghetti. We went to the store when we got there and got what we needed for chili one night and spaghetti sauce for another night, we were gone 3 nights. We would come back to the hotel at lunch time and I used a slow cooker liner (best thing ever) put in the stuff for chili and came back to eat dinner. Dinner costing about $7 for your family is better than $ 60. For spaghetti I used a liner threw in the meat, pasta, and sauce and set it on low and when we came back for dinner the pasta was cooked and it was yummy, $3 meal. Sandwiches can be made in a hotel room to. This is how we did things growing up too. Gives you more “fun money”. I love this idea! We spend so much on food while out of town and this is a great idea I will try next time! I don’t think I could cook all the meals for a month in one sitting but I do like knowing I have one or two ready made meals for a rainy day when I don’t feel like cooking but need to make something. I also take my left overs and freeze them for my hubbies lunches. He likes having a variety to choose from for work and it saves us money on take out. I also like the idea of once a month cooking, but not the practicality of it. I have limited close family and would rather beg for a night out with my dear husband than a day to cook, when I am asking them to babysit for me. Also said dear husband, does not like casserole’s, or pot pies, or well any meal that would be “easy to freeze” He also does not like left overs. However I have found that I can prepare extra meat and make it into something else and that is not deemed as left overs, the closest to casserole as I can get is enchiladas, and they don’t come out right frozen and reheated. BUT I can make the meat for several enchilada nights, and just have to assemble and heat the night of. Aside from browning and freezing 1/2lb and 1 lb portions of hamburger, I also make double or more sized fajita meat(red meat,pork, chicken) and freeze that in enchilada portions. I also like to make pork roast in the crockpot with pineapple juice. I make take the pineapple juice and drippings and use that to make a thick teriaki sauce, serve with rice and pineapples and sliced cucumbers, the next time I serve the porkroast, I heat it with BBQ sauce to serve on buns, or not depending on your taste and what every other sides you have. There are two and one-half (9 mo. old) of us eating our meals. With things like homemade beef and noodles (something that is time consuming in itself)and my cheddar potato soup that I just throw together with some rice, I make LOTS of it; then I freeze the leftovers. Oh yeah, I highly recommend getting a rice maker; it’s so much faster to cook the rice, and it doesn’t stick to the pain or boil over into my stove. I have a Tupperware rice maker, and I love it! Anyways, if I am going to make tacos I will cook several pounds at a time, mix rice with it, and pop the leftover taco/rice mixture into the freezer. Then on an evening when we are going to have tacos for supper, or just don’t feel like cooking something we reheat the taco meat that is all ready to go for us; it’s a cheaper/better option than frozen pizza all the time. When I make taco meat, I don’t add extra taco seasing because of the rice; the flavor isn’t as strong, so it’s not as tasty, but it works and is cheaper. These are what I consider my “free” meals. Marathon cooking definitely isn’t for me, alothough the thought of it sounds great, but doing things like what I mentioned has really helpd me save time. I try to make excess for freezing as much as possible, but it also hard to convince my husband that just because my cooking is so good doesn’t mean that it all needs to get eaten in one meal. I like your comments at the end of your post. I chose to do batch cooking when my four children were ages 6 to 18. It was a fun productive thing to do with them. For younger families getting afew friends together and sharing work child care and the end product works well. I felt we saved when we bought products that were on sale for a certain type dish, like chili,Chinese dishes and Italian dishes. I still see stores having sales like this occasionally. Now with just two to cook for I make a meal for six and freeze two meals. That way I always have a variety of meals available for quick meals. If you are just having meat and vegetables I make those fresh and add in from my supply. I love your posts and read them as soon as they hit my email. I have learned a great deal from you over the past few years. I do not waste my time cooking for an entire month. When my children were small, they would gather in front of the TV on Sunday afternoon and while I was having time with them, I was also cooking for the week. Not full meals, but main courses. I made meatballs, hamburger patties, a pot of beans, a crockpot full of stew and anything else on my menu for the coming week. I leaned this great habit from my mother and used it most of my life. Once Monday came around and things got hectic, I always had something made, even if we didn’t eat it on the designated day. Thanks for your hints and comments. They are real blessings! I literally groaned when I saw the title for today’s article and then started to laugh after reading it. I, too, have been there and done the once a month cooking, several times in fact. It was one of the most ridiculous things I ever tried to do. I spent a lot of time deciding what to make for the meals. Then made a long grocery list. Then spend a long time shopping for everything. And where to put it all?? Leave it out until cooking makes the kitchen a mess! There is no way you can plan, shop, and cook in one day for a family. The cooking was horrendous. Trying to constantly have something going and being prepped. You have to wash out bowls and dishes all the time for the next thing or are grabbing whatever. It is very hard on your feet, legs, back and brain. I was still cooking when it was dinner time- what do you feed your family today? (they don’t mention that!) and the clean up after, which is considerable. And you still have to plan for thawing and cooking the meals. Plus there is nothing fresh, so you end up making something anyhow. Well, this is long, but I have a much nicer system now by tackling a week’s meals. Works even if I don’t have all the meal’s in mind. I take an hour on Friday or Saturday. I dice 2 onions, 1 green pepper, cut a container of celery and carrot sticks, and any other fresh veg I am going to use, and place each in a plastic container and refrig. Then I make a green salad of lettuce and cabbage, place in a big lidded bowl and refrig. This takes me a half hour or so. The chopped veg are ready to use in anything. I dice up the celery and carrot sticks for cooking. 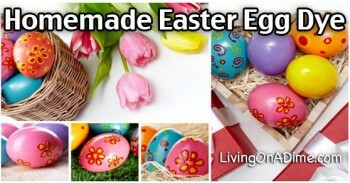 I may also put chicken or hamburger in the crockpot and cook rice, pasta, hard boiled eggs, or baked potatoes while I am working on the veg. Depends on my energy level. We plan to eat leftovers for lunch, and I generally cook extra of rice, pasta or potatoes to be used in another meal. At the end of the week, anything we haven’t eaten goes into a casserole, soup, or stir fry. I think it is good time spent planning out a week or 2 of meals and then deciding a day ahead what is for dinner. You can gather what you need and prep in little bits of time. Thanks for making me feel like I was not the only one who had this experience!! Julie as if you couldn’t tell from the article, like you I am a firm believer in dividing things up into smaller easier steps. Trying to do too much in anything gets so overwhelming. We have learned a lot from our Stone Soup luncheons at church. Everyone brings extra vegetables and meats in and we cook up a huge pot of soup. We eat well, then we make frozen meals for those in need or extras for the rest of our individual week meals. It has helped when spring gardening, to summer mowing and winter shoveling just to come in and pop a few individual meals into the microwave or onto the pot on the stove. We love a turkey casserole all of leftovers- layers of vegetables, meat stuffing, gravy cranberry sauce and potatoes on top… It heats up in the oven within a half hour or so and it all melts together. And it freezes well. We have made lasagna with uncooked noodles and even with spaghetti noodles! They freeze well IF you can get them into the freezer before someone sees/smells it! We don’t overdo on the liquid if we know it is going into the freezer- you can add a bit more when you reheat it. I cannot think of anyone in the group that doesn’t use portioned meats in their freezer or has it canned by the amount you would use in a meal. We have also used dehydrated foods to make quick meals- Tomato powder is the absolute best add in! Carrot powder adds a lot of bulk to your sauce and adds those vitamins too. Yeah! and getting meat at the day of sales- its a plus for us all! Tried the OAMC one time–was exhausted to the point of chest pains when I was finished. And I’m only in my early 40’s! The book actually said to do it in 2 days (or 3 if you count shopping) if you read the fine print. Day 1 to shop, Day 2 to prep ingredients and cook meats, and Day 3 to assemble everything. I was foolish enough to try to combine days 2 and 3–I already had bought the ingredients or had them on hand. Then the dinners didn’t fit well in my freezer and I needed some of those dishes during the next few weeks. The thing I DO like best about OAMC is the idea of cooking some things ahead like chicken and browing hamburger meat, and having it ready to use in the freezer. I cut the cooked and deboned chicken with kitchen shears (my first time trying that) and it went REALLY fast. If you put the cubed chicken in a gallon freezer bag and lay it flat to freeze, it is easy to scoop out a cup or 2 for recipes. THAT is the time-saving secret for me. I like to cook quick meals, too, and don’t often spend much more than 20-30 minutes of hands-on cooking time per meal. The hassle of trying to thaw then bake a frozen meal just was really inconvenient for me. There were a few recipes we liked in the OAMC book that I still occasionally use, but make fresh. Terrie, I put the cut up chicken in a layer on a cookie sheet and partially freeze, then put it in a freezer bag. It is much easier to take a cup or two out to use in a recipe. I do the same thing with berries. I agree with your thoughts on once a month cooking. Another thing is.. what about fresh veggies & salads? They cannot be frozen and are much healthier when prepared fresh. Our daughter-n-law homeschools 4 children. Part of their schooling is being on a weekly schedule of being kitchen helper and cleaning the kitchen after meals. They also prepare a large salad that will last for 2 or 3 dinners. This saves preparation time on the off days. As for me, I prefer cooking a little extra when I prepare a full meal, then we eat the leftovers the next night. Sometimes the leftovers are put in a wrap topped with a little cheese and heated in the oven for an easy meal without a lot of fuss. I enjoy your helpful tips even though my husband and I are seniors.. there is always something new to learn. Thanks. Thank you for putting into words what I have thought many times. Even though I do not have small children at home, this still doesn’t make sense to me. It makes much more sense to make extra and freeze it, if your family will eat it. My family doesn’t like casseroles if they have been frozen. I will probably open a whole can of worms, so before I say anything, what I do is NOT affordable for beginners and if you work full-time outside the home, probably not a wise investment of your time. OK, that disclaimer said, I’d like to share whatI do. Our family has a huge garden, we have hunters and fishermen and we buy organic beef. So our freezers are jam packed. You add to that the fact that my husband hates casseroles, freezing meals doesn’t work well for us. I do two things with my family. First, because I am able to pressure can, I will often take a couple days a month and pressure can multiple batches of chili (each family member has their own favorite), different soups and sauces. I even can venison, hamburger & fish. That way we always have something to choose from to make a large family meal, or if someone needs a fast lunch, they can make a selection as well. Second, I do as many of you, choose a couple of main meals for the week and use those leftovers to spin off other meals. Such as making large potroasts and enjoying that day 1 and then turning leftovers into stroganoff, bbq, soup, etc. Mix in with that a roast turkey or chickens, etc. and making those 2 main meals that week, they easily spin off into fast and easy meals the rest of the week along with what I have canned in my cabinet (or for those that freeze – same concept). Oh, also Jill and Tawra, I always keep my Dining on a Dime cookbook handy for those nights my brain can’t think of anything to do for supper!! We’ve loved everything we’ve tried! I’ve become the queen of leftovers and my family doesn’t hate it at all!!! Thanks ladies! Thank you! I have thought they were nuts from the time I seen this trend. Thanks so much for validating the other side! I’ve had many of these same thoughts. I have three small ones at home and expecting baby #4. Grandparents are far away, I shop the sales each week and don’t see how purchasing a deep freeze (and paying more electricity) will benefit us in the long run. Yay for no more false guilt! And remember spices intensify when frozen, so use a lighter hand when seasoning for the freezer. Good luck to those who are happy with once a month cooking. I found cooking, after work, quite therapeutic. Today’s spaghetti Bolognese became the next day’s cottage pie, curry or Grouch Stew with added beans and stuff.These days ,the son, who is still at home, will take a portion to heat up at work. I use the Once A Month Cookbook only in the winter. In the summer, it is too hot and sweaty to deal with days of cooking when we would rather have fresh-from-the-garden salads. I still make fresh meals for Sunday dinners since more people will usually be coming to eat. But coming home from work and knowing everything is ready is wonderful. Since it is only 2-3 times a week it works well. I don’t notice any freezer taste, but I only use the gallon zip-lock bags. My mom and I recently did a weekend of cooking. We divided the food so we all had enough for 35 meals. Was it hard work? Yes. Was it worth it? Yes. I work outside the home and don’t get home until 6, so I wanted something for my husband and daughter cook that was partially prepared. I use short cuts and my crock pot on a regular basis. Eating out is not something my family takes lightly, it is a once a month treat. I was able to save money but my mom and I didn’t make fancy or expensive meals. We wanted home-cooked meals that made our lives a little easier. I did not use a large freezer, only the one on my fridge. The meals I chose to fix where things I normally don’t cook on a weeknight because by the time I get home it takes too long. The best part of the whole experience was cooking with my mom. I learned some new things and at some point and time my whole family helped with cooking. It turned into a family experience that we are planning to do again. I don’t think it is for everyone and I think that you have to be choosey on what you prepare. Somethings do not freeze well and do taste yucky when thawed and cooked. No one way works for everyone’s family. Glad it worked pretty well for your family! I don’t have a large freezer either, only the one on my smaller-than-average fridge. I agree that you have to pick and choose and figure out what parts of OAMC, if any, work for you and your family. I found OAMC in the early ’90’s and it saved me.I was a single parent for many years, and after working all day, getting home with kids, I would put a casserole in the oven, and the 45 minutes it cooked I had time to settle the kids in, check homework., etc. and then dinner was ready. I would make 5-8 beef dishes one weekend day when the kids were with their father, then 5-8 chicken the next. Each cooking episode was about 5-6 hours, and yes, it was exhausting. It saved money because we didn’t drive through fast food because Mom was too tired to cook. Most importantly, it saved me time during the week,even with making a fresh salad or vegetable, and we ate well. I started out following the recipes, and how to do OAMC instructions in “Once-a-Month Cooking” by Mimi Wilson and Mary Beth Lagerborg. From there, I found more recipes from other sources that worked with the freezing method. Every family will be different. This worked for me at that time. I love “Dining on a Dime”. Many of your recipes work wonderfully for freezing, too. I’ve never done the OAMC because that was always just too much work at one time, so I have always just cooked enough for the two of us and then frozen the leftover for later meal. But I really need to pay more attention to what freezes well AND still tastes good because many times I pull something out, reheat it and it just doesn’t taste very good to me. I have good luck with big pots of spaghetti sauce, portioned into meal sizes. And I precook hamburger meat to use during the week for tacos or quick dishes. I used to assemble a quichem freeze it unbaked, then thawed and bake later. And I assemble meatloves and freeze them unbaked, and bake later. I cut lasagna into portion sizes and wrap separately so my daughter can reheat some for her dinner. Butternut squash soup and chili work well. But my pot roast and gravy changes texture so its not so good. Same with the pasta casseroles and chicken dishes…not so great. My trouble is remembering to pull stuff out to get it in the refrigerator to thaw and be ready to cook when I get home from work. Mostly I seem to use my freezer to buy ingredients at good prices, to use for future measl. OK I am a bit older than many of your readers but this is not the first time this cooking for a month has come around in fact I have a cookbook I bought just for that purpose. This did not work so well for me, my family was not crazy about most of the casseroles I prepared and some of it became freezer burned and had to be thrown away. However I did learn a few things over the years. I now on occasion make two meatloaves cook one and freeze one. It is just as easy to cook 3 times the amount of rice at one time and portion it out and freeze, just take it out the night before you intend to use it and let it thaw in the fridge and it taste just as good as fresh. I also freeze mashed potatoes in portion sizes for my husband and myself let thaw in fridge overnight and warm in microwave, this is great. But the marathon cooking was exhausting, time consuming and no fun! I would not recommend it, but I am a great believer in make a little extra here and there,one other tip when I do make extra I take the time to label and date the food, this makes a world of difference when you are in a hurry. No-one ever mentions the expense of buying a month worth of food in advance just to cook it in advance! We certainly couldn’t afford that & I don’t know many people who could. I think it’s much better to bake a double portion every so often & freeze that to have ready in an emergency rather than, as mentioned, spend 3 days cooking and ending up with everything else gone to pieces around you after that time. Thanks for all your posts! Thank you for reminding us that we don’t have to feel guilty because our freezers are stocked and ready for everything. Just last night since I was rushed, I realized that I didn’t have to bake my dish just to have the “crusty top” of buttered crackers and parmesan cheese. Just warmed the ingredients and mixed it together. I put the “crust” in a separate bowl for those who wanted it. Voila! Dinner served. No guilt. I have two cookbooks on making meals in advance but have found that lots of the recipes are casseroles which my husband just will not eat. What I have found, though, is some great recipes for making tomato or alfredo sauces that I can use with the ingredients I have. When I get ready to shop (mostly every other Saturday), I make a menu list. This lists the days of the week and what I think I’ll make: ie: Monday-meat loaf, Tues-spaghetti. I make sure I have the ingredients or plan to purchase them along with any sides I plan to serve with them. But, come Monday, meat loaf might not suit my taste so I switch off and have one of the other day’s meals. As long as you have the parts of the meal, your menu really doesn’t have to be written in stone. Perhaps you want to attend an event, you can jockey your menu options around. I have found that this really works well for me. Some nights I get home late and just want scrambled eggs – so I add that in and have today’s menu another day. Also, I go to the Farmers’ Market every Saturday and buy the freshest produce. I spend Sunday afternoons, cooking the broccoli, kale, green beans so the rest of the week, I just have to warm them. Sometimes, I will cook meat for the remainder of the week but if that is all you have to do for dinner, and the rest is already done, dinner doesn’t take too long. And you really can’t beat fresh or frozen produce. Great article. I am so relieved that it was not just me who wondered what all the fuss was about once a month cooking. When you have a large family like we do, most of these recipes don’t even feed everybody. I imagine people are still looking for a magic system to make it easier, but cooking every night still is a good way to be creative, and take advantage of what is on sale or on hand. I just found your website after owning the book for years. It is my go-to cooking reference…almost like a security blanket at times. Especially the crepe recipe. I attempted oamc in the early years of my marriage…but haven’t since the birth of my son over two years ago. Even then it was mostly cooking preps…dumping marinade and.protein in a bag…usually chicken leg quarters. Each recipe tookmaybe two minutes to prepare. Now we.either grill a bunch during our grill sessions … a better use of the charcoal rather than just grilling a.bit for one night…and freezing the leftovers. I meal plan a month at a time based on what we already have in the pantry and freezer or will be able to buy on sale during sale cycles. The Friday before I shop for anything needed for.the following week…and prep and.refrigerate the recipes for the next week…chili for three meals last week…jambalaya and the makings for.chicken fried rice this week. I’m off on weekends, so this has allowed me to simply reheat…without worry of fridge thawing that has been known to take.days. Love the bar b quing more then one meal idea. We don’t always mention this so thanks for the tip. My husband and I discussed once a month cooking and decided that the cost of an extra freezer and the electricity wasn’t worth it. This also takes away the spontanaity of meal making. I wouldn’t want a bunch of cassaroles ready to eat and the weather warms up. A tip that works great – buy chicken breasts with bone when it goes on sale for .99 to 1.29lb. Take the skin off yourself, cut the bulk of the meat off and freeze individually for other meals. Cook the bones with remaining meat right then. In 20 min. 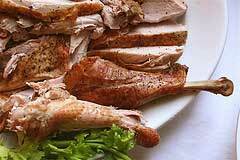 you have broth and meat to pull off the bones to use for anything you would use shredded meat for, much the way we pull the meat from turkey carcasses. I make many turkeys for the meat during the last part of October through Christmas because turkey meat is so cheap then. I have a freezer full of cooked chicken and turkey, and raw depending how quick of a meal I need each night. I also have precooked sausage, we don’t eat much red meat or I would do the same with hamburger. A little handful of sausage adds so much flavor to “leftovers” soup. (added tip) My husband had to prep for a colonoscopy and he was allowed to have broth. Straining the real meat broth allowed him to “eat” something that felt more filling and wasn’t as salty as bouillion. I was so happy to have so much broth ready that he could have as much as he wanted, the process was a little less miserable for him. Yeah around here, once food goes in the freezer, we aren’t too enthused about eating it. And that is only ever if we have something left from a meal. Our family is small for now, so a “normal” meal can last us twice. I tried to make 18 crockpot meals and freeze them in the vacuumed sealed bags the freezer so all I had to do was defrost the night before and put in the crock pot before I went to work, for some reason this did not work well, we had burnt shrimp & sausage jambalaya and burnt cheesy ravioli casserole… I cooked according to the recipe for the allotted amount of time…I have never had a complaint against my cooking from my husband before but after we started this process, he finally made the comment that he understood I was trying to make homemade meals and save time and money, but he was tired of eating burnt food. what am I doing wrong??? Any suggestions.???? This is really more common then you think. Many crock pots cook way too hot. Here are some things that may help. You need to be sure that your food fills up the crock pot at lease 2/3 of the way full. It won’t heat properly or evenly if you don’t which means you may need to get a smaller crock pot. In this case sometimes bigger isn’t better. Make sure no steam is escaping. Some pots now come with a hole in the lid for a spoon slot. These let out too much steam. If you are a newbie crock pot user don’t start with recipes that have pasta, rice, sour cream or cheese in them. Practice with things like soups, stews. Do something like a roast or chicken with a few carrots and potatoes (leave the potatoes with their peels on). These help you get the feel and to know your crock pot. If you are going to leave things all day you might want to get a pot that has a warm setting on it. Even though I have written a crock pot book and Tawra uses hers quite often I have never been able to figure out how crock pot cooking works for women who work and have to leave it all day. As I was researching recipes and probably 80% or more that I came across called for the recipe to cook for only 4 hours so I could not figure out how that would help someone going to work. That doesn’t mean they aren’t nice to use sometimes and I was able to come up with many many recipes in our crock pot cookbook but it wasn’t easy. Hope this helped a little. If I didn’t answer your question let me know and I will try again. My old Rival crockpot never got too hot but my new one cooks hotter and so I have found that I need to put lots of water in the pot, NEVER cook on high and don’t put anything with a cream or a cream soup in it until I am home and can monitor it. I put the crockpot on about 7 am and get home 12 hours later and the meat is falling apart. I cook chuck roasts with carrots and potatoes. I do not put the carrots and potatoes on the bottom even though the instructions say to do that, but instead put them in the liquid around the side of the meat. When they are are the bottom, they tend to burn. Also, I cook a whole chicken or drumsticks and thighs with the bone in but the skin removed. I find that the leg quarters or the thigh and drumstick still attached to one another, cook better than smaller pieces. I rarely cook chicken breasts unless they are bone-in because they cook too fast and then get very dry. I really don’t make casseroles in my crockpot when I am leaving it on all day. If I were home, like on a Saturday, I might try it but when I am going to be out of the house for more than 6 hours, I will only do meat. 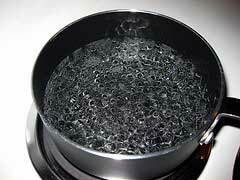 A pork roast is excellent in the crockpot, too, but again, lots of water since my crockpot runs hot, the extra water makes sure it does not evaporate and ruin the meat. Sometimes, if my husband is at home (he is retired), I have him check for water at least once in the late afternoon. If you have kids at home, they could do this for you. Anyway, hope this helps. You just have to cook things that will not dry out or can tolerate long cooking times. I think the Lord told us to pray “Give us this day our daily bread” for a reason. Fresher is better tasting to my family. I tried the OAMC in the 90s and didn’t like anything I froze as well as what I prepared fresh. I regressed to only freezing pre-done pie crusts, cooked ground beef, cooked de-boned chicken, etc. to speed up meals. Cooking throughout the week is therapy for me. Just when I thought I was finally free of regular cooking I get full time care of my grandchild… weird how much ideas healthy cooking has seemed to change in such a short period of time. I think for the first time ever I am finding myself overwhelmed with what to put in luchboxes, what to feed the family without feeling guilty and how to take short cuts in cooking without feeling bad because my meals dont look like the lovely ones that I see see in books and the net. Your post I think also helped me to remember to trust my own instincts about how food should be cooked and served and what is healthy, rather then relying on people with big incomes and helpers to tell me how to do it. I think there is too much information on food that is simply not that realistic for everyone. The fact that I have have just now spent $25aud (about the same in usd) on maybe 2 days of school lunches for just one 6yo child is to me a bit of a joke. But there you have it.. if i dont provide it the school will call me and its not even a private school..
Thankyou again your post was refreshing and more then worth thinking about in more then just once a month way.. I understand exactly what you are saying Dianne. First I too am of an age where even though I have written cookbooks and have a website on that subject I really don’t want to cook any more. I also think the world has gone totally insane when it comes to food and what to eat and what not to eat. Food “what not’s” have become just like clothes fads. This style is in this year and that is not. In the same way that I refuse to follow fads in my clothes I do the same with my food. I don’t believe in jumping on the band wagon just because “they” said this is the way it should be or studies show this might cause this or prevent that. But yet they state these things as fact. In the same way I buy clothes that are classic but still fashionable, neat and make me look nice I do the same with my food. I keep it simple, stick to the basic food pyramid and relax. If I was in your place I would slap some peanut butter on a piece of white bread, throw in an apple or banana, a cookie and call it good for lunch for a 6 yr. old. That menu worked great for the past 3 or more generations and the only generation having problems in the health department are the ones now who are trying to scientifically analyze every bite that goes in their mouth. They are going to stress themselves into a heart attack and a lot of good that healthy eating will have done them. Moderation and common sense. My daughter fixed my grandson a really nice lunch everyday when he started school. Carrot sticks, fruit etc. and he loved graham crackers so she would give him a couple of those. Each day for weeks he came home with nothing but the grahams being gone. He was to young to figure out yet to dump it so mom didn’t know he hadn’t eaten his lunch. 🙂 She gave up and just sent him double grahams and nothing else. He ate a great breakfast and dinner so she didn’t think he would starve. The teacher had a cow. Sent a note home that they felt she wasn’t sending a proper lunch to school. It really concerned me because here are people who are suppose to be teaching our kids and yet they don’t have enough wisdom or understanding of kids to know that kids for the past 100 years if they don’t like their lunch they will either trade it or dump it. All these new food fad’s remind me of the story of the Emperor’s New Clothes story. Some guys out to make money told the vain king that would make him some special new clothes that was invisible to all but the stupid and incompetent. No one, including the king and leaders, could see these new clothes but didn’t want to say anything because they were afraid of being thought of as being foolish so they all went along with it. A young child saw the king and said “The king is naked!” Of course everyone tried to hush him and say he didn’t know what he was talking about until they finally had no choice but to agree he was right. I say all this to say you are probably wiser then most for realizing their is something not quite right with all these food dos and don’t s so relax and feed him a bowl of cereal once in awhile when you don’t feel up to cooking. He would much rather have a happy relaxed grandma then one who is stressed all the time on if she is feeding him right or being politically correct with his food. I also think pinterest was created by a man to trick women into thinking they should be perfect house keepers, cooks, etc…lol. I agree that cooking once a month isn’t practical for me either with kids ages 1,2,8, 11, and 16. But when I was working and we had bible school in the evening I cooked a weeks worth, put it to thaw overnight and was able to come home, stick in oven, and get kids ready, eat, and leave. if I make meatloaf, I freeze one….also same thing with lasagna. I don’t have a whole day to devote to cooking, but a little extra a couple times a week can fill up freezer for days you need them. I use a 6 quart roaster oven instead of a crockpot so I can adjust the temperature to what I want and I always cook my rice in the microwave two parts water one part rice on high for ten to 20 minutes depending on how much I am making at the time it’s always perfect. tried the oamc and hated trying to figure out what to have every day for a month and wasn’t able to take advantage of weekly sales. Love some of the other ideas I got though!! I hadn’t thought of it, but you are so right. My mom and my grandma didn’t do “once a month” cooking, per se, but they cooked ahead of time like that a lot. They both had huge freezers and they were full of home-cooked foods. I can’t see myself committing to once a month cooking like this. Don’t have the freezer space and a family is time consuming. Don’t really want to spend one of my two days off of work just cooking. However I do often try to make extras of things when I am cooking. Like if I am making a batch of chili, I just double it and freeze half. I do also make things like burritos (breakfast and dinner varieties) ahead and freeze them. These make great quick breakfasts or lunches for my hubby and son. Otherwise we would be buying these types of things pre made and I can’t see spending $4 for a package of burritos I can make for like $1.50 and are tastier anyways!! I keep a list of quick and easy dinners on hand that I generally have the ingredients on hand for most of the time and find this is more practical than doing large batch cooking. We also like a little more variety so we may only have something like chili once a month, so having 3 batches in the freezer is a waste of space. I do agree with you from the point that it does take a lot of time and effort to get those meals all cooked, BUT the idea that you can chop everything, onions, carrots, celery for a bunch of meals all at once and clean your equipment once does save time. I think you could save money by buying in bulk as well. I’ve followed recipes that freeze very well, and double bag things, so they stay fine in the freezer for quite some time and never taste freezer burned! I do prefer just to triple, quadruple recipes now, rather than once a month cookie. I made 2 lasagna’s recently and have homemade sauce to make two more fresh. I made enough meatballs to last the next 6 months. Those are the types of things I just won’t go to the trouble of making more than a couple of times a year, so I go to town when I do. I have the Once a Month Cookbook from 19 years ago, so it isn’t exactly a new thing…we did it for a while, but with a small family, it was more trouble than it was worth. I would prefer to make up extra chili, for example, and freeze that for another meal rather than having 2-3 exhausting days (I can’ string 3 days together anyway with my work schedule) just so I can have some casseroles in the freezer. It was a good thing to do before I had surgery so we’d have a stockpile of easy meals while I was recuperating, but other than that, I don’t think I’d do it again on a regular basis. It is new for this generation. We get tips all the time from readers who have new tips like how to use lemon for your hair or vinegar to clean this or that and they all think it is a new idea and it is to them even though I have been using it for years or have found the exact same tips in a 150 year old cookbook. It really is new to this generation. I opened a magazine not to long ago and they had this great “new” idea. The thing is I saw the same idea in a 1917 ladies magazine that I have. I took a Freezer Cooking class last year at our community college. I couldn’t imagine working for a whole day, once a month, just to prepare food! What a waste of time, I thought! But, the teacher did give some other good tips. What I try to do is make a dinner, and store the rest in the freezer for another night in a few weeks. Then, I just made dinner for 3 different nights. Also, I like to fry hamburger and put in bags (like you mentioned doing) in the freezer for a quick start to another meal. I don’t freeze everything, but I do make sure that I freeze any leftovers that could make dinner for another night. Thanks for your entertaining opinions on this subject! Many of these once a month freezer recipes call for expensive ingredients, such as refrigerated biscuits, which I don’t use. Also, following someone else’s prepackaged list doesn’t allow me to take advantage of sales and seasonal produce. But the biggest financial waste I see is using the fuel to bake a casserole, using electricity to freeze it, and then using fuel again to bake it. That could get quite expensive if done frequently. Many recipes call for just that! 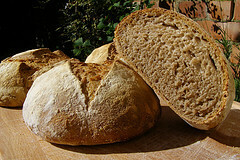 And what would double baking do to some of the nutrients? The only thing I don’t understand is the spending 30 mins to an hour cooking each night. I have never spent that long fixing a meal even a large meal. Plus when you say you only spend 4 hours fixing 3 wks of meals did that include making salads and things like that? Plus people always say I am not as tired because I don’t have to clean the kitchen. Don’t you have as many plates, cups, silverware,crockpots and pans that you warmed things up to clean at the end of the meal like any regular meal so don’t know where the not having to spend as much time cleaning up comes in because you are cleaning the kitchen really twice -once when you first cooked the things and then a second time after the meal. Sometimes I think we don’t really carefully add every thing up when we do things. As far as spending time with the kids my kids were always in the kitchen with me helping and spending time when I prepared the meals and they were learning to make them with me too.